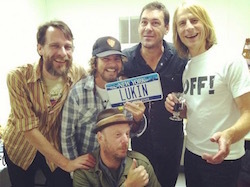 Less than a week ahead of their highly anticipated return to Europe, thanks to Hub Music Factory we briefly interviewed Mark Arm, the legendary frontman of Seattle rock veterans Mudhoney. Our Pearl Jam fan-based community is turning 14 this year… nothing compared to your almost 30-year career! You are one of Seattle’s longest-running bands. How does it feel to have reached such a milestone? It doesn’t feel like a milestone to me, it’s more a matter of creeping normalcy. What at one point in my life seemed like an outrageous impossibility, is now just the way things are. We didn’t have to do anything to still be a band, we just had to avoid breaking up. Your last record – “Vanishing Point ” – is one of your best ever, powerful and sharp. Are you currently planning your next album? We have a couple of new songs and a bunch of cool riffs we need to sort through and arrange. Over thirty years ago you co-founded Green River with Stone Gossard and Jeff Ament. In your opinion, has the underground music scene changed a lot in recent years? Is there anything you regret of your early days? I don’t regret anything. I’ve made plenty of mistakes and I hope I’ve learned from them, but regret is wasted energy. Of course the undgerground music scene has changed over 30 years. It would be remarkably boring if it had stayed the same. I remember that after the historic Green River reunion in 2008, there was talk of a possible album of unreleased songs. What happened? Has it been permanently shelved or can we expect a surprise in the future? I’m not sure what’s going on exactly. I know that Dean Whitmore, who works with me at Sub Pop has been digging through old tapes recently with Jack Endino. I don’t think that there is much in the way of unreleased songs. Once I hear unreleased songs, it’s usually pretty obvious to me why those songs were unreleased. In 2011, you were at Pearl Jam’s 20th anniversary celebrations in East Troy, WI – we were there too and spotted you walking among fans in the afternoon. 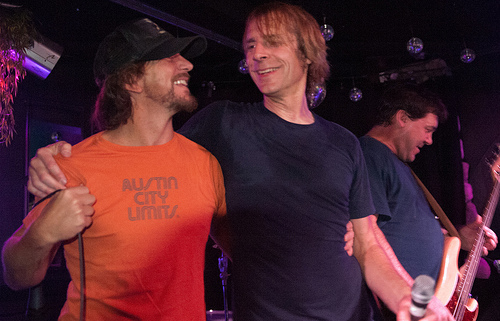 It was crucial that you were there because of your importance, not only for the whole Pearl Jam family but for what the Seattle music scene still means to a lot of people. Any story you’d like to share about that legendary weekend at Alpine Valley? I can’t think of any interesting stories, but I had a lot of fun that weekend, especially on the second day when the weather was much better. What was your reaction when Pearl Jam included in their 1996 record (No Code) a song called Lukin, honoring your former bass player Matt Lukin? Have you ever considered coverin’ it? It would be really cool, like closing some kind of music circle! We thought that was funny and very nice. We probably will never complete that circle. One of my all-time fave records is a tribute to the Sonics that you recorded as The New Strychnines back in 2000. Any chance to see you in action with that band again, at least live? Thank you Luca, that was a super fun thing to do, but now that the Sonics are playing again, there’s no need for a Sonics tribute band. We played with them a couple of weeks ago and they are fantastic! See you in a few weeks ! Thanks for everything!